A card for a coworker. I felt that it really fit her personality with the soft muted colours and the simplistic design. I love being able to use my new stamps! 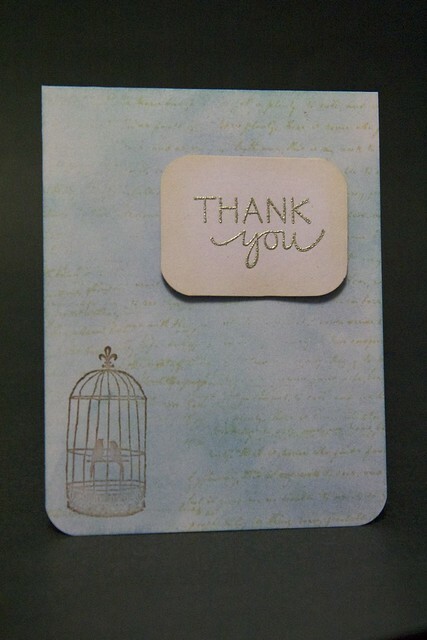 (Both the bird cage, and the “thank you”). I went with Oatone day and snapped up every single one I could find of that design in different sayings. This entry was posted on March 9, 2012 by debbe. It was filed under 365, craft and was tagged with card, card making, cards, stamps, thank you card, tuesday.